TORONTO – Her arrival is announced by a rattling at the key hole. Aunt G and Uncle C share a look across the room. Their relationship with their neighbour is more than a friendship – it is a safety net, because they see each other every day. A missed visit would be a red flag. “You call me Inga,” she says as we are introduced. Her shirt is light pink and has a large appliqued butterfly on its collar. Her sweater is a darker shade of pink, marked with black and gold swirls across the shoulders and chest. Her leggings are white, have huge black polka dots, and end before her white ankle socks. Her hair is cut short and fashionably. Her glasses are stylish, with dainty white arms that end in a diamond of negative space near the lenses. Her face is open and friendly; when she is not smiling, the memory of her smile lingers. Her voice is well-used to laughing. Today she comes with a small gift – a toy from a kids’ meal – to pass on to my niece’s three little girls. While my aunt pulls open the plastic wrap, my uncle and I talk about coal mining. An abandoned coal mine entrance in Glace Bay, Cape Breton. His father spent 30 years in a colliery in Glace Bay, Cape Breton. He was one of the lucky ones – black lung didn’t get him. A few years ago, we toured a colliery in Glace Bay and heard the Men of the Deeps choir. I’ve been hooked ever since and could spend all day listening to mining stories. That the miners eventually received paycheques rather than cash was the women’s doing, my uncle told me. Otherwise, cash in hand, the workers were inclined to stop at the bar on the way home and their wives might not get their household allowance. On the room’s large TV, an anchor is chatting with an astrologist about the possibility that we’ve all been living under the wrong sun signs. My aunt asks me what I think. “It’s not! June 11! That’s my birthday!” She gets up and comes to stand beside my chair, and she asks me again. “I am June 11, 1933.” My father’s birth year. I think – I hope – that maybe I’ll grow into the same sort of smiling, friendly, energetic senior Gemini that Inga is. “It’s a little Frisbee,” Aunt G reveals in her soft voice, holding up the two plastic pieces that are the kids’ meal toy. She carefully inserts it into the green launcher. You could put an eye out with that. “It shoots out?” Inga says in alarm. Too late, she snaps at my aunt: “Don’t you do it!” The little Frisbee flies up and out, ricocheting off a glass shelf of knick-knacks and disappearing behind a wrapping-paper bag. Inga moves fast, before I can begin to lift myself from my chair. She rummages in the corner, plucking the disc from a deep corner and holding it aloft. She doesn’t say it aloud, but “tsk tsk” is written all over her fine German features. She snatches the launcher on her way back to her chair. She aims carefully and pinches; the miniature Frisbee soars along the hallway, straight and smooth as a glider. It seems like it’s moving in slow motion down the hall at waist height, arcing upward slightly before beginning its descent into the bathroom. It makes it all the way to the far wall. We’d been holding our breath, but release it in giggles. Inga retrieves it and shoots it again. Then I have a go. None of us loses an eye. Inga disappears back to her apartment for a little while. It is filled with dolls, Aunt G tells me. Many of them are porcelain; some of them have been painted by Inga herself. There are teddy bears, too. When she comes back, she has a bear for each of my little great-nieces. She has me say their names as I put them in a bag, so I won’t get mixed up: A classic, jointed bear for Lily, one with a book for Emma, a polar bear for Sophia. And she has something for me, too: a thumb-sized green bear delicately stitched together by her sister in Germany. 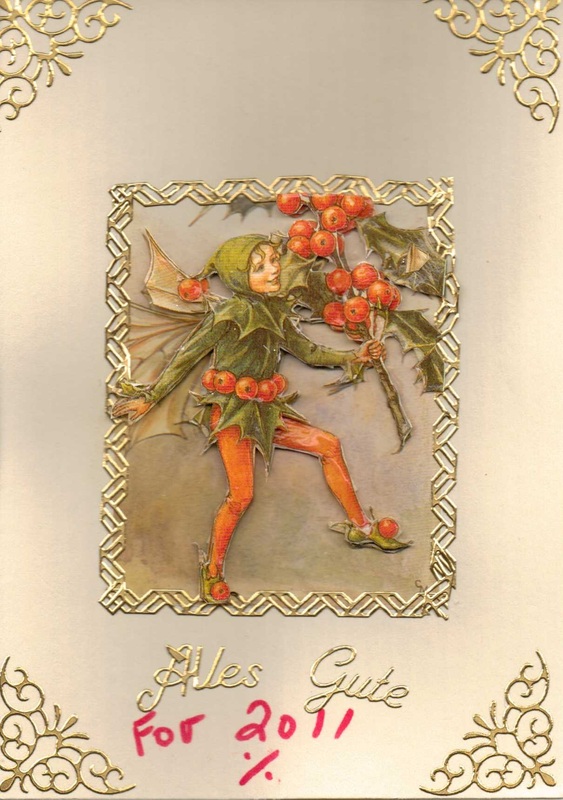 But best of all, she’s brought me a beautiful card with a cutout faerie that says “Alles Gute.” All’s good. Inside she’s written: “To a Zwillinge, from a Zwillinge. Inga.” From one Gemini to another – friends even after so short a visit.